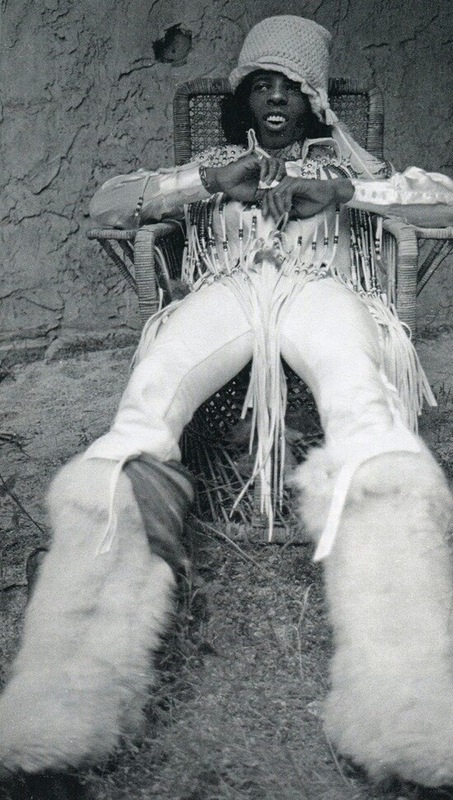 The mid 60s was an extremely fertile period for James Brown. 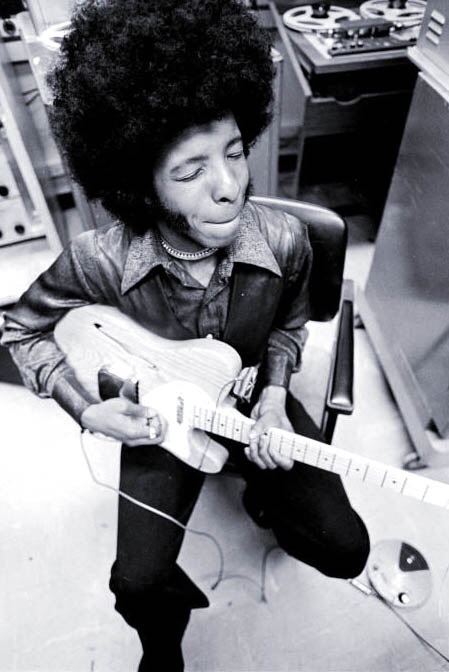 By then he’d moved away from the tear-soaked, down-on-his-knees gospel/soul that defined much of his early career. 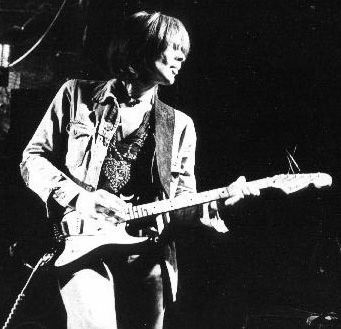 Relatively straightforward 12 bar song structures were replaced instead by jerky, jagged one-chord grooves. Brass stabs emphasised the first beat – “On the one!” as he’d instruct his musicians, and the tracks would tick along with well-timed metronomic precision. No-one knew it at the time, but the Godfather of Soul was inventing funk. To be in James’ band then must’ve been terrifically exciting, yet extremely stressful. Here you were, creating this new form of dance music, all the while unable to enjoy playing for playing’s sake, lest you miss the beat and risk a fine from the boss. James Brown records are littered with phlegmily barked instructions; “Horns! (Bap! Bap!) Maceo! 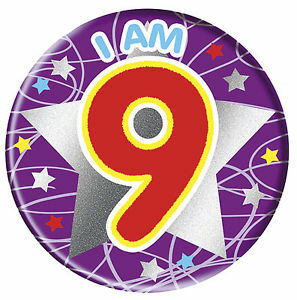 (Toot! Toot!) Pee-ann-er! (rinky dink dink dink) – every musician hitting his part with laser precision. Miss the beat and you’d find your pay packet a wee bit lighter come the end of the week. When you strip the records down into their component parts, they’re extremely simple affairs. Take 1965’s Papa’s Got A Brand New Bag. Individually, there’s fairly little going on; a rickety-tick drum beat played by Melvin (brother of Maceo) Parker, a repetitive, a see-sawing, octave-hopping bass line, a simple horn section, blasting ‘on the one’, a chicken scratching guitar, stuck forever on a Major 9th chord (I think it’s Db, though the released recording was sped up half a tone to make it faster and more energetic, so this, muso minds, would in effect make it an E major 9th) and James’ gravel-throated lyric about an old guy who’s discovered he likes the new dance all the kids are doing. 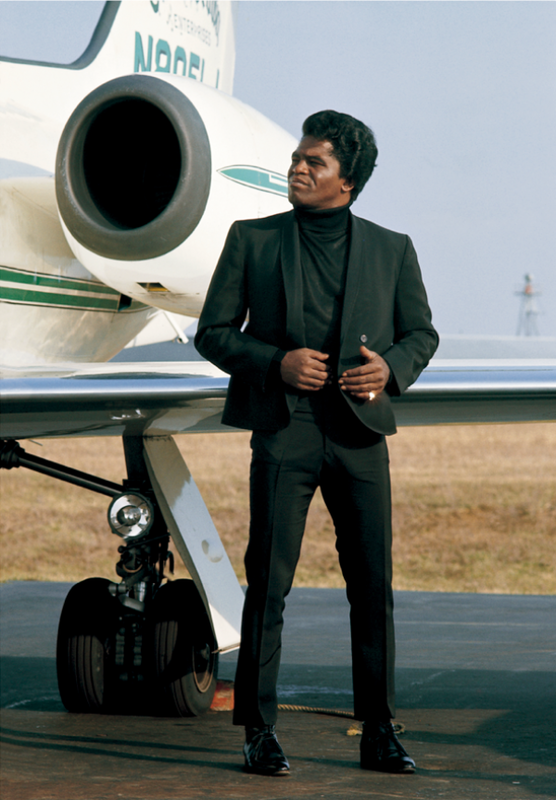 James Brown’s Star Time box set – one of THE essential additions to any serious music collection features the complete, unedited take of Papa’s Got A Brand New Bag. When the track was originally released as a single, it was edited so that ‘Part 1’ became the a-side, and the extended funk workout that followed was renamed ‘Part 2’ and featured on the b-side. The box set includes James Brown’s declaration that, “This is a hit!” before a note is even played, and for the next 7 or so minutes, the band follows their leader with an unnerving mechanical rhythm. The whole recording sounds tight and taut, lean and mean, stripped of unnecessary excess and flab. It fair packs a punch. A favourite dancefloor filler in this part of the world, it can make my pal Greg move in ways a white man from the west of Scotland has no real right to. Soul of a black man, feet of a rhythmically-challenged Glaswegian. Right on. You know this already, of course, but James Brown’s influence goes far and wide. Early 80s DIY punk/funk collective Pigbag named their signature instrumental Papa’s Got A Brand New Pigbag in clear homage. An instantly catchy 8 note riff, it failed to chart initially. Nowadays, Papa’s Got A Brand New Pigbag is ubiquitous with over-zealous, celebratory football chants and montage soundtrackers who think they’re still making yoof programmes for the TV, thanks in no small part to Paul Oakenfold’s ‘monsta!’ souped-up makeover around 20 years ago, but Pigbag’s original version took 2 or 3 goes before it went chart-bound. 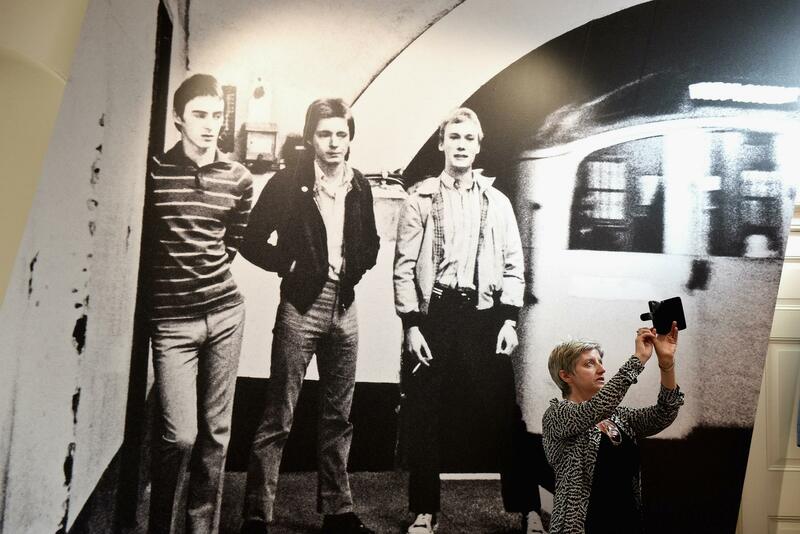 The Jam, in particular their keen-eared, sticky-fingered bass player Bruce Foxton, must’ve been blushing slightly when it eventually started gaining airplay. By this time their own Precious, out as a double a-side with A Town Called Malice was starting to get played on the radio and you couldn’t help but notice the (cough) similarity between the two tunes. 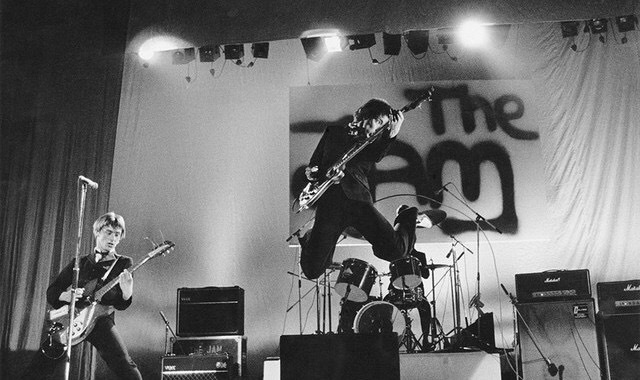 The Jam even went as far as naming their posthumous live album Dig The New Breed, a line from the James Brown tune that kicks off this post. Which just goes to show, what goes around comes around. 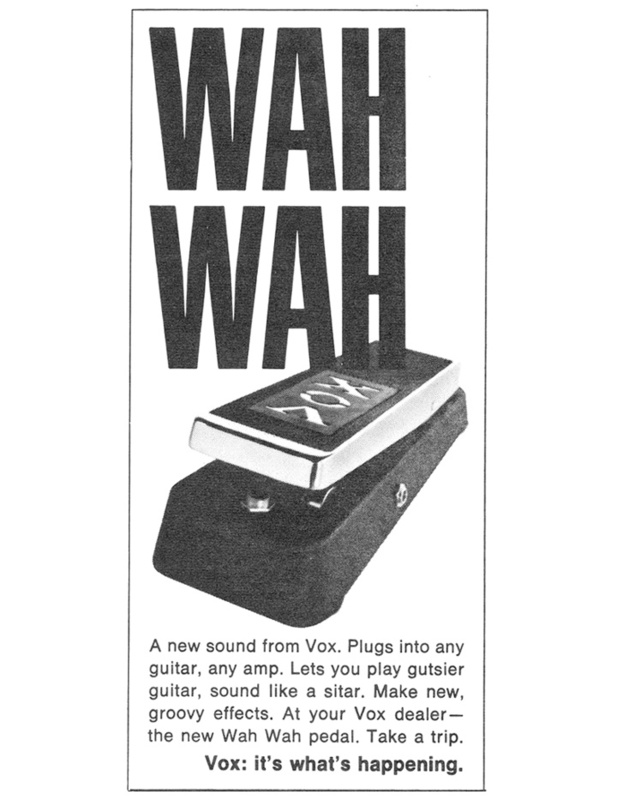 The wah-wah was created by happy accident, when Vox engineers got the circuitry mixed up in a new range of Beatles-inspired amps they were producing. 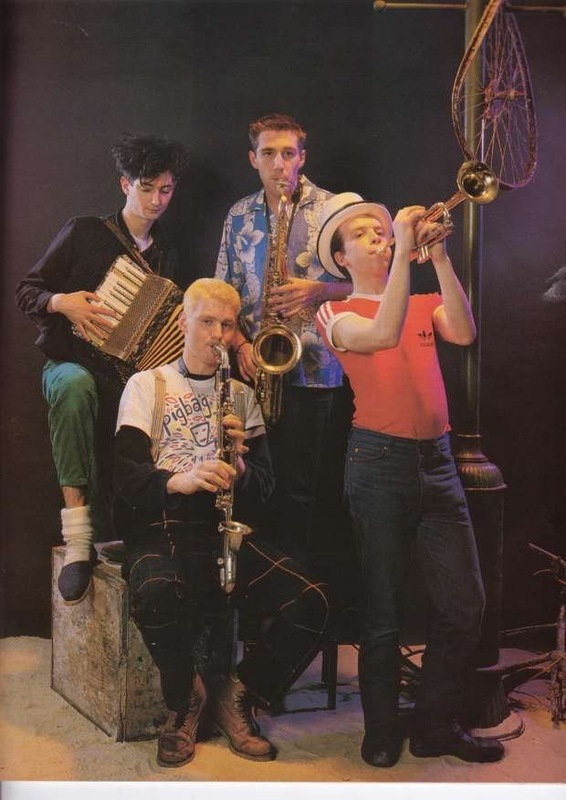 Realising they’d just created an electronic version of the effect jazz trumpeters had pioneered in the 20s by muting their horn with a hat, they seized on the potential and began producing wah-wah pedals. Almost immediately, guitar players saw their appeal. 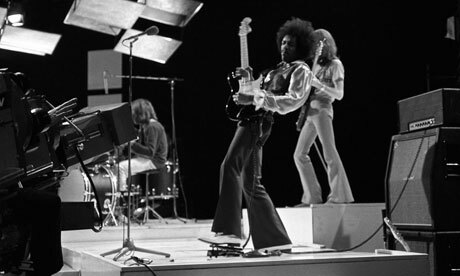 Jimi Hendrix was an early adopter of the effect – Up From the Skies on Axis: Bold As Love was one of the first tracks recorded with a wah-wah, and from then on in, it featured heavily in Jimi’s incendiary output. The Burning Of The Midnight Lamp, All Along The Watchtower, Voodoo Chile (of course) – all featured the screamin’ sound of the wah. There he is above, quite literally rockin’ the wah. 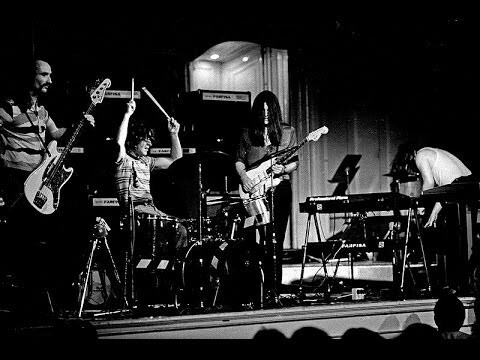 Before long, no self-respecting psychedelic act was without a wah-wah, and the the pedal became an integral part of the sound of the era. As a general rule of thumb, the wider the flares, the wilder the wah. The Electric Prunes even went as far as endorsing the effect. 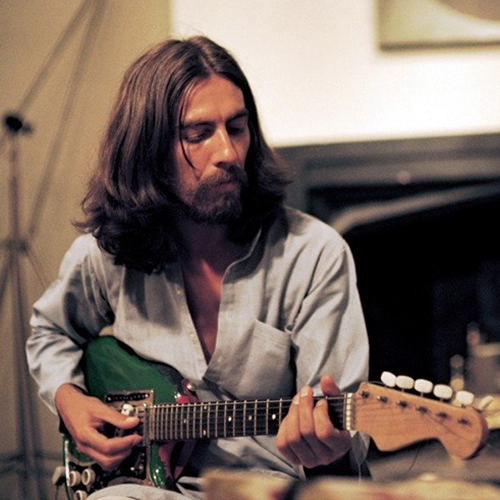 George Harrison, newly freed from the shackles of The Beatles and with a sackful of songs he was eager to release under his own name employed Vox’s pedal on the self-explanatory Wah-Wah from 1970’s All Things Must Pass. It’s a cracking track, almost throwaway pop, although it maybe buckles a wee bit under the pressure of Phil Spector’s over the top production. Sleigh bells? Aye! 35 backing singers? Of course! More brass than a colliery band? Well, it is being produced by Spector. A multitude of guitar tracks? Well, it is being played by George Harrison. The main riff is suitably Eastern-influenced, a call and response one chord groove that swaggers like Muhammad Ali in the 15th round. 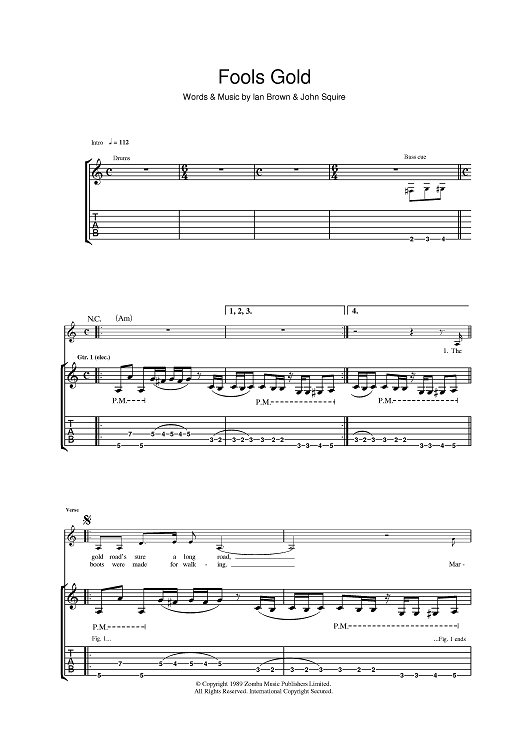 It soars with each key change, guitars free-forming over the top while the original riff underpins the whole thing. George even has the cheek to steal the chorus from that Vox ad at the top there. Listen again to the last 30 seconds. Who noticed?!? Kula Shaker certainly did – George’s track practically gives birth to the daft four-piece, but don’t hold that against him. Om shanti shanti shanti. 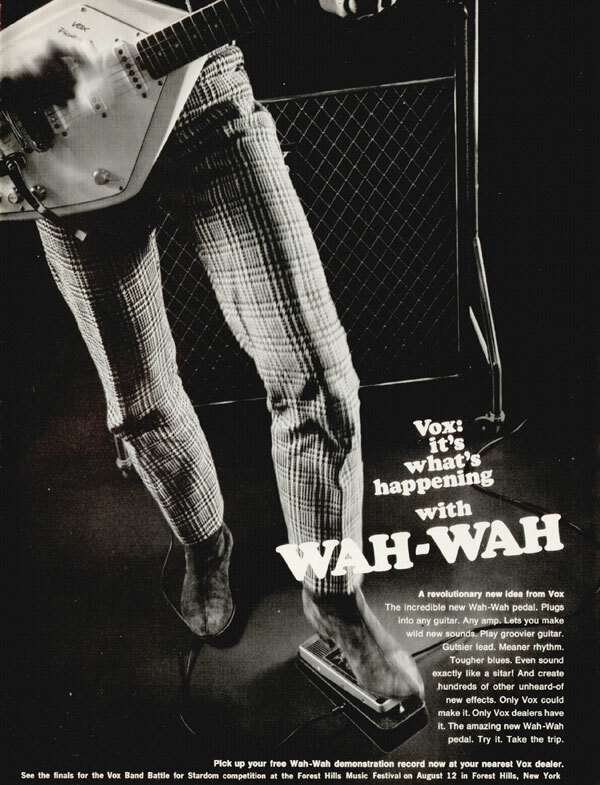 By the 70s, the wah-wah was being employed to great effect by the soul community. 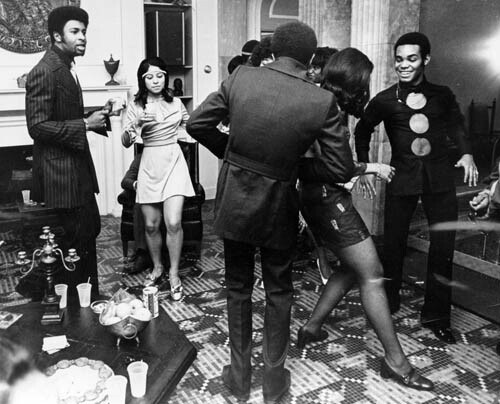 Curtis Mayfield….Sly Stone….The Temptations….they all had wah-heavy records out. 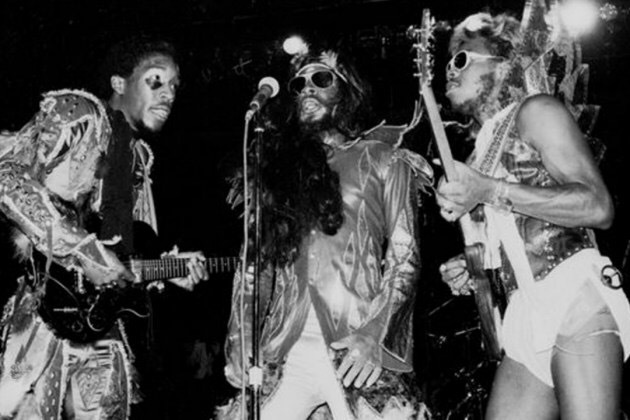 Rather than solo, (that would be far too ‘rock’), the players created the distinctive wacka-wacka sound that’s now become the ubiquitous sound of the wah-wah. Y’know, Theme From ‘Shaft’ ‘n all that. Since then, the wah-wah pedal has featured on all sorts of tracks by all sorts of musicians, from Joni Mitchell and John Martyn to Metallica and The Melvins. It’s reassuring to know that in any given record collection, you’re never more than 30cm from a track featuring a wah-wah. A fuggy haze hangs low over the East River between Manhattan’s Financial District and the brownstones of Brooklyn. 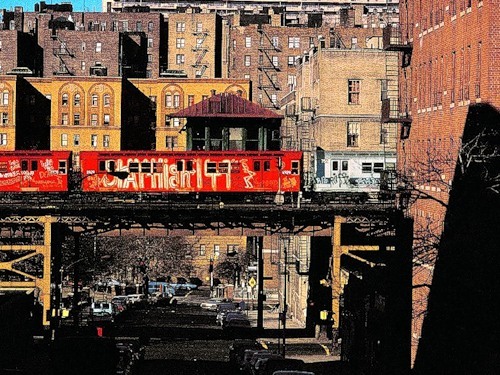 Clattering like one of those wooden toy snakes across the Williamsburg Bridge weaves a long, low train, lazily rolling its way along the J line. Sprayed in a dulling array of pinks, greens and primary colours, tagged to within an inch of illegibility to those over 35, its contents sit in silence, oblivious to the multi-coloured carnage in which they are cocooned. Inside is not much different. It looks violent. It feels violent. 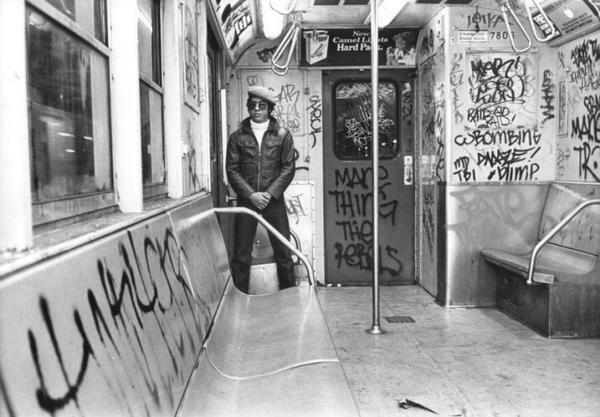 Doors, windows, seat coverings; every available surface space is thick with the same chunkily inked shout-outs to whoever is reading. Every passenger finds a point in front of themselves and focuses, daring not to lift their head and avert their gaze lest they happen to catch the eye of someone close by. Women clutch their bags and count the stops until they can get off. Men, the good ones, the ones who’d like to think of themselves as the have-a-go hero when something bad kicks off in here, try to look both non-threatening yet tough. The bad ones just look threatening. And tough. If this was the start of a movie, it’d be soundtracked by this, Shambala from The Beastie Boys‘ Ill Communication LP. Purveyors of the finest gravel-throated shouty hip hop since 1981, Beastie Boys also did a mean line in often-overlooked instrumentals. Shambala is spacey, droney and built upon a bed of Buddhist chants and brooding wah-wah. Kinda vegetarian funk, I suppose. There’s a nice drop out where the hi-hat does its best Theme From Shaft impersonation before the clipped wah-wah brings us back to the incidental music in a 1976 episode of Starsky And Hutch. 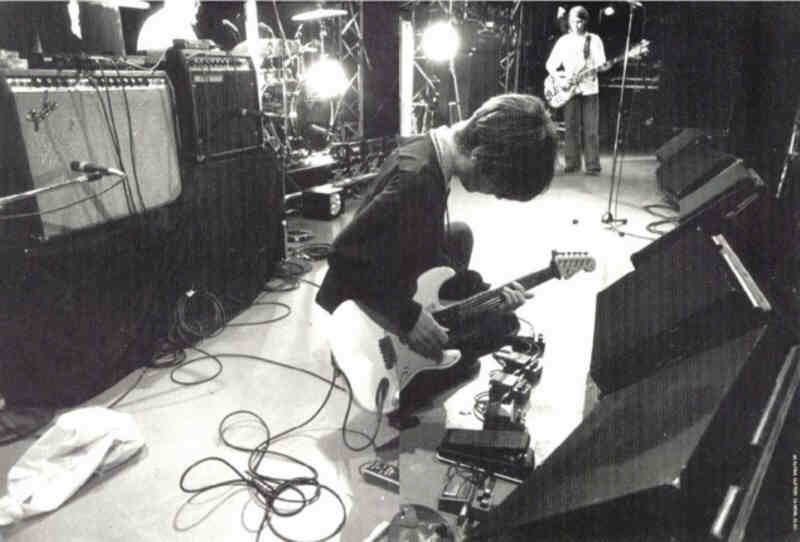 That wee scratchy noise you can hear in the background isn’t authentic vinyl hiss – it’s the sound of the Stone Roses taking notes in preparation for their next set of ker-ching! comeback dates. Also on Ill Communication is Bobo On The Corner, another fantastic slice of Beastie funk. 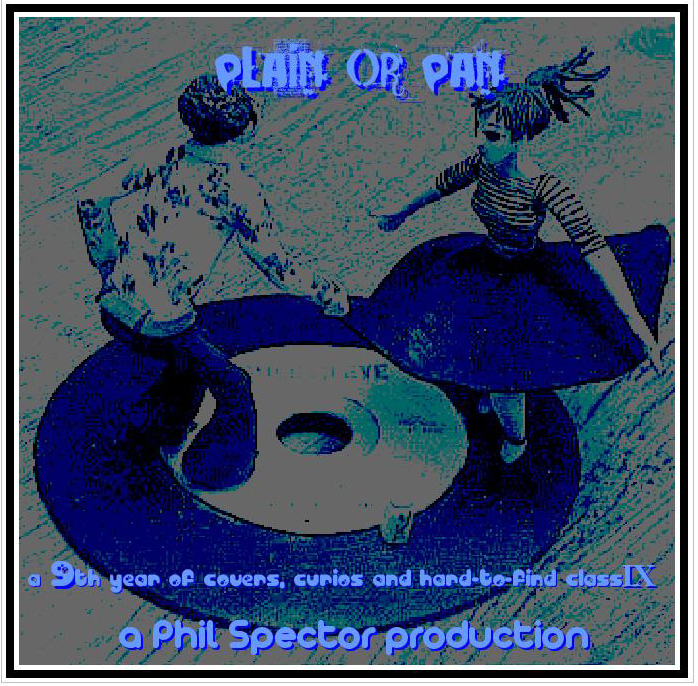 More clipped wah-wah and droney bass, this time the sampled Stubblefield-aping shuffle beat comes from, presumably, one of those New York street musicians who can make 3 oil drums and an empty can of vegetable oil from Chinatown sound like a particularly funky octopus playing Give It Up, Turn It Loose. A bit like this guy…(maybe he’s the real Bobo on the corner. Or maybe not)…. If you prefer yer Ad Rocks ‘n MCAs ‘n Mike Ds rrrrrrappin ‘n rrrrrrhymin’, ch-check this out- Ch-Check It Out from 1997’s Hello Nasty, devoid of loops, samples and other assorted musical flim-flam. Just the 3 voices a-riffin’ and a-goofin’ off one another, like Benny and the Top Cat gang recast as super-bratty teenagers. And, bringing us back to where we came from, a vocal-only Stop That Train. Hot cuppa cwawfee and the do’nuts are dunkin’, Friday night and Jamica Queen’s funkin’. Essential! Ach. Y’know you’re gettin on a bit when Beastie Boys start dying round about you. Rap on, MCA!